As is evident in the first few frames of this security camera you can see the building (reportedly a shopping mall type structure) collapse. That’s extremely fast considering that it basically went down on the first few earthquake wave crests in the first few seconds of this 7.0 quake. It really shows the potent power of The BIG ONE! Imagine what that would do in your city. At seven seconds into the video the building is standing. The camera starts moving at second 8. Smoke from the collapsing building is visible during second 10 and clearly the building falls by second 11. That’s about three seconds from first wave to catastrophic destruction of the structure. That’s not even enough time to comprehend what is happening if you’re standing in the structure before the roof comes down on your head. Yikes. Cars driving down the road clearly divert from their lanes. At second 25 a truck appears on the left side of the video and attempts to turn left onto the main road and arcs left losing control – having just missed a car by a second or two – and comes to a stop before hitting the collapsing building. Double yikes. 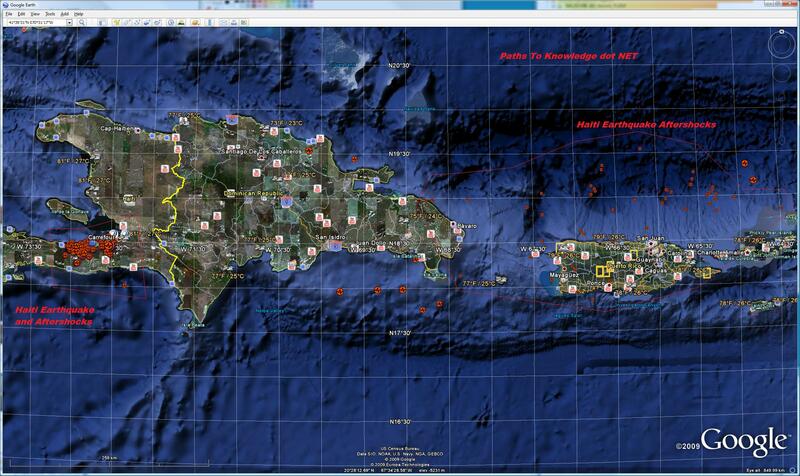 As you can see from this Google Earth Satellite image below annotated with earthquake symbols, most of which have happened between Jan 10th, 2010 and today, Jan 18th, there is a massive cluster of aftershocks to the west of the hard hit area of Port-Au-Prince. What is of note though is the numerous numbers of low magnitude quakes just to the north of Puerto Rico and the Virgin Islands. Some of these are actually under Puerto Rico. Too close for comfort. This is quite the number of aftershocks and also reveals the underlying fault lines. Do these sets of aftershocks under and to the north of Puerto Rico and the Virgin Islands provide a warning of dangers lurking or has the pressures on the underlying plates been relieved somewhat so that danger has been reduced? I wonder. Update 20100119: Additional earthquakes: “It’s one week after the Haiti Earthquake and the World has seen earthquakes in Argentina, Venezuela and most recently Guatemala.” – San Francisco Gate (1). How likely are these additional quakes related to the Haiti quake and aftershocks? Could these be adjustments resulting from the Haiti quake? Hmm…. Update 20100120: The quakes continue in the region with another large one hitting Haiti (5.9 with some reports saying 6.1) today.